If I had to choose my last dessert, it would probably be cheesecake or some pastry cream laced tart. Certainly there would be mounds of strawberries on top. Now a cookie? I don't think so, but I do have an awfully hard time resisting them when they are on my counter (usually briefly in a tupperware, since they never make it to a jar). Really though, I think my tall man might actually choose peanut butter cookies as one of his all time favorites. Don't get me wrong, I think peanut butter cookies are yummy- but usually, they just make me want to wrap them around candy bars or drizzle them with chocolate or embelish them some way. But, since it's my tall man's birthday week and he was pulling weeds all morning I figured I could make the cookies how he liked them. This recipe is a little different than mine but I think the final product tasted almost identical, so I've included our family favorite version. I'd never rolled them in sugar, though, which was fun (especially since it made it so the tines of the fork didn't stick when I squished the cookies- a probably a usually remedy by dipping the fork into some flour every few cookies). Don't forget to scoop them out and bake them on a Silpat for uniform, picture-perfect results.Thanks for a great recipe choice, Jasmine! You made my husband a very happy man! 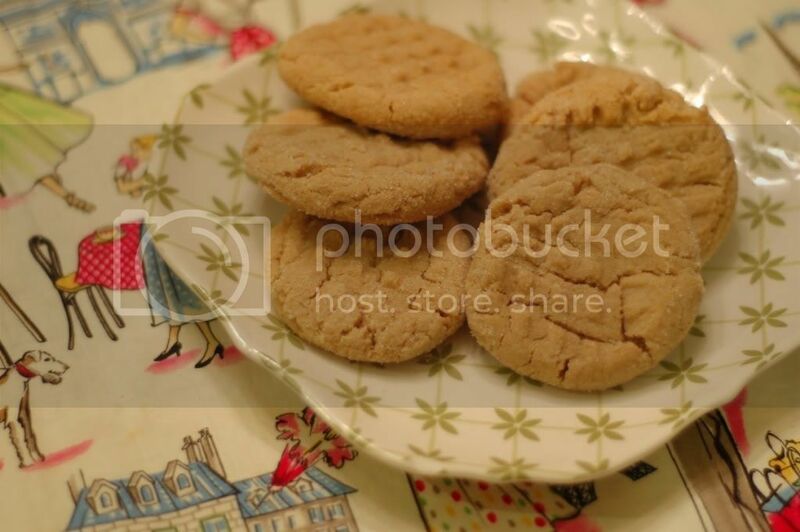 Are you an easy going peanut butter cookie man like my husband? What would your last dessert be? Preheat oven to 375. Cream butter and sugar. Add eggs and vanilla and beat until well combined. Mix in peanut butter. Slowly add dry ingredients and mix until just combined. Scoop dough out, place on baking sheet, spacing apart generously, and bake from 9-12 minutes until dough has set but before cookies take on too much color. Remove from sheet and allow to cool. Enjoy warm! I think they would be wonderful with a chocolate drizzle! While I do love a nice dessert like a tart filled with pastry cream and fruit, I'm really a cookie kinda gal. These were good cookies. Glad you could make them just for your man! I love squishing them with the tines of a fork. They look great! I love pastry cream, but my last dessert would have to be a cake of some sort. I'd eat these cookies while I was waiting for it to bake, though! I don't think I could narrow it down, but it would surely involve ice cream. Mine would probably be my mother's flan. I actually love peanut butter PIE. Or strawberry shortcake would be my last dessert I think. Your cookies look good. My man loves peanut butter too! If I made these I probably wouldn't be able to eat any before they were all gone. Thanks for the awesome recipe! I would pick Creme Brulee. I do love cookies--mostly those with frosting on them. Can't get overly excited about PB cookies abut yours look good. I am going to make these an put a chocolate drizzle over the tops. Im sure your husband enjoyed them very much! they look so good. I love your printed material under the plate..it looks vintage and very cute!